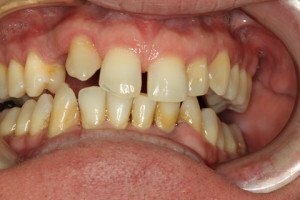 Teeth that are badly stained, shaped or crooked can be cosmetically improved by a simple cosmetic procedure called veneers. Veneers are thin pieces of porcelain bonded onto the front of your teeth. The veneers will change the color, size and shape. Veneers are typically used on teeth that are chipped, discolored, not proportional, unevenly spaced or crooked. Little or no anesthesia is needed. Veneers are very durable and can last up to twenty years. They are resistant to staining from coffee, tea, or even cigarette smoking. Veneers are most often made by a dental lab technician working from a model provided by Dr. Nugent. Both you and Dr. Nugent will work together to create your ideal veneer form and shape before everything is sent to the dental lab. Veneers are generally irreversible because it is often necessary to remove a small amount of enamel from the teeth to accommodate the thin porcelain shell. Porcelain Veneers can hide undesirable defects, such as teeth stained by tetracycline, by an injury, and are ideal for masking discolored fillings in front teeth. 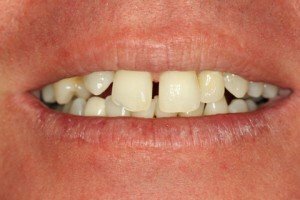 Patients with spaces between their front teeth or teeth that are chipped or worn are great candidates for porcelain veneers. 1. Diagnosis and Treatment Planning: Dr. Nugent will examine your teeth and discuss your case with you. You provide input as to what your goals and ideal smile will be. Dr. Nugent will then take impression to make stone models of your teeth. 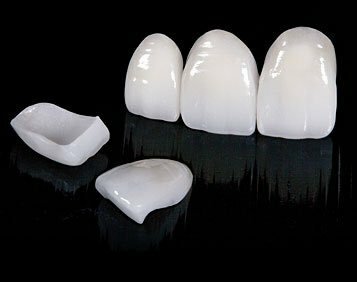 The stone models will be used to create your new smile out of wax. This will give you a preview of your new smile. Any changes or tweaks to size and shape and be easily made. 2. Preparation: During the tooth preparation visit Dr. Nugent will shape the front teeth to accommodate the new porcelain veneers. Typically, about a half a millimeter of the tooth is removed, which may require a local anesthetic. For certain patients no preparation of the teeth may be necessary. Next, a mold is taken of the teeth, and sent to the laboratory for the fabrication of the veneers. 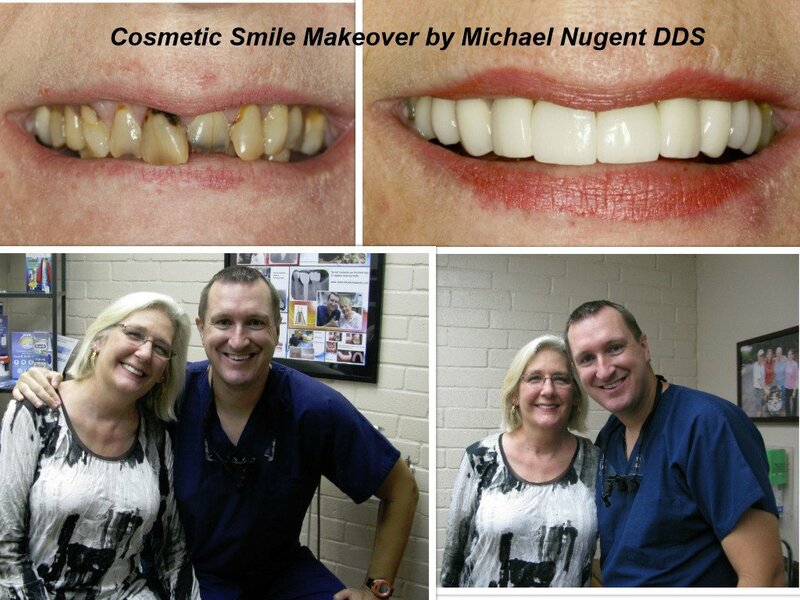 Dr. Nugent will make your temporary veneers before you leave. 3. Bonding: During the final “bonding” appointment the veneers are placed on the teeth. The veneers are checked to make sure they fit. 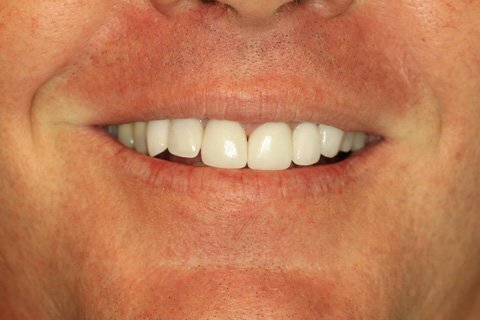 You will get a preview of your new smile before the veneers are bonded into place. Rarely any adjustments are made to the shape and contours. However, if changes are needed they are done before bonding. To bond the veneer, the teeth are cleansed with specific chemicals to prepare the tooth for the veneers. Then special cement is placed between the veneer and tooth. A curing light cures the cement and the veneer is bonded to the tooth. At the end of the final appointment the patient was so overwhelmed with joy that he gave Dr. Nugent a huge Bear Hug. The patient had always been embarrassed by his smile. He now has a great smile to go with his great personality. 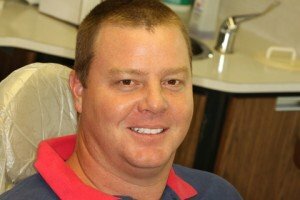 Dr. Nugent is a Pasadena, Texas Cosmetic Dentist who can help give you the smile you have always wanted. From simple teeth bleaching for a dazzling white smile or a complete makeover with porcelain veneers, Dr. Nugent has the experience and skills to make your dreams a reality. Our office is located at 3421 Burke Rd, Pasadena, Texas 77504.